The Great Wall of China , originally uploaded by magical-world. 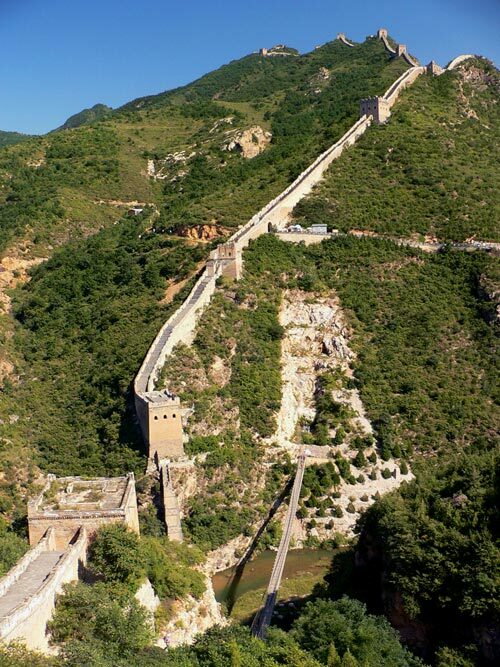 Traditionally known to the Chinese as the "Long Wall of Ten Thousand Li", the stretch of formidable defensive structures built to ward off invasion of the Celestial Empire by barbarians is most often called the "Great Wall" or the "Wall of China" by Europeans. 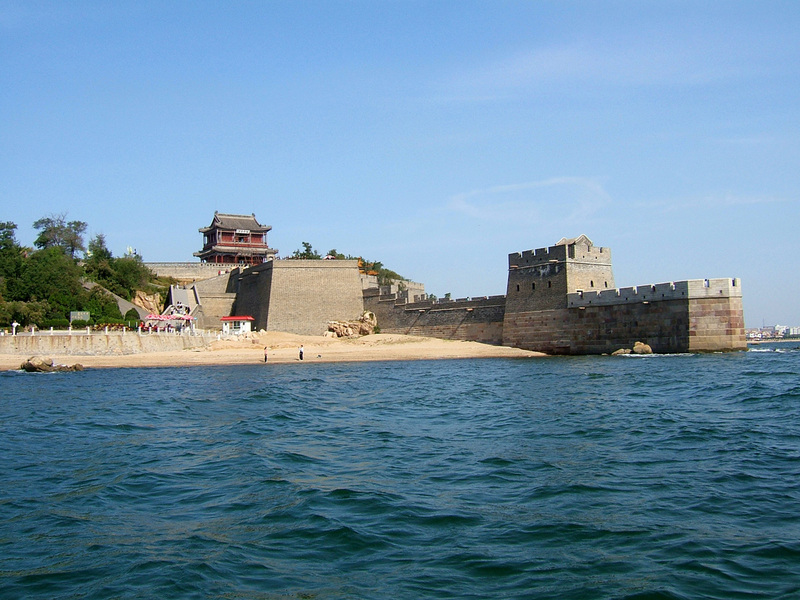 The history of these extraordinary fortifications goes back to the Chunqiu period (722-481 B.C.) and to the Warring States period (453-221 B.C. ), so-called because of the long struggle among seven rival dynasties for supreme power. The construction of certain walls can be explained by these feudal conflicts, such as the one built by the Wei in 408 B.C. to defend their kingdom against the Qin. Its vestiges, conserved in the center of China, precede by many years the walls that the Kingdoms of Qin, Zhao and Yan erected against the northern barbarians around 300 B.C. The Great Wall of China at Simatai, originally uploaded by Nagyman. Beginning in 220 B.C., Qin Shi Huang, the founder of the Empire of the Ten Thousand Generations, undertook to restore and link up the separate sections of the Great Wall which had been built in the 3rd century B.C., or perhaps even earlier, and which stretched from the region of the Ordos to Manchuria. Towards the west, he had the fortifications extended in the valley of the Huanghe all the way to Lanzhou. Thus was the first cohesive defense system of which significant vestiges still remain, completed, shortly before the accession of the Han dynasty (206 B.C.). During their reign the Great Wall was extended even further, and under the emperor Wudi (140-87 B.C.) 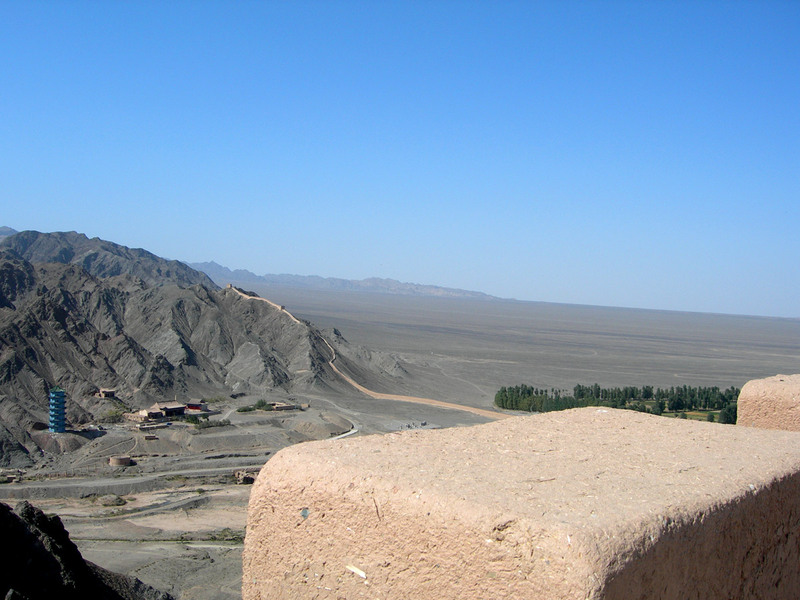 it spanned approximately 3700 miles (6,000 kilometers) between Dunhuang in the west to Bohai Sea in the east. The danger of incursion along northern Chinese border by the federated tribes of Mongols, Turks and Tunguz of the Empire of the Xiongnu, the first empire of the steppes, made a defense policy more necessary than ever. Alternating military actions with intensive diplomatic efforts, this policy entailed massive relocation of Chinese peoples within the frontier zone. 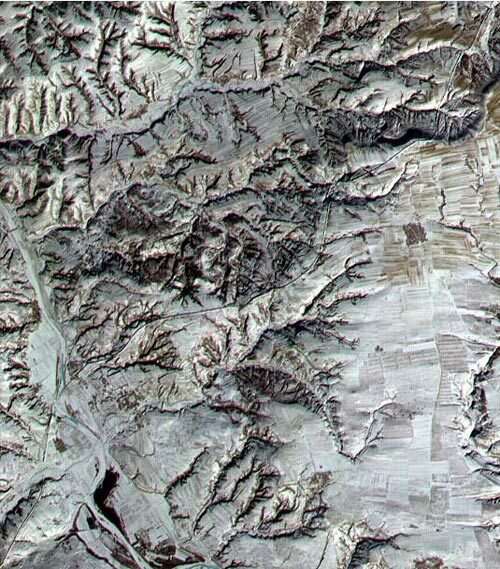 In 102 B.C., there were 180,000 peasant soldiers in the "command posts" of Gansu. The Last Door Under Heaven, Great Wall at Jiayuguan the far Northwestern End, originally uploaded by neal_mcquaid. 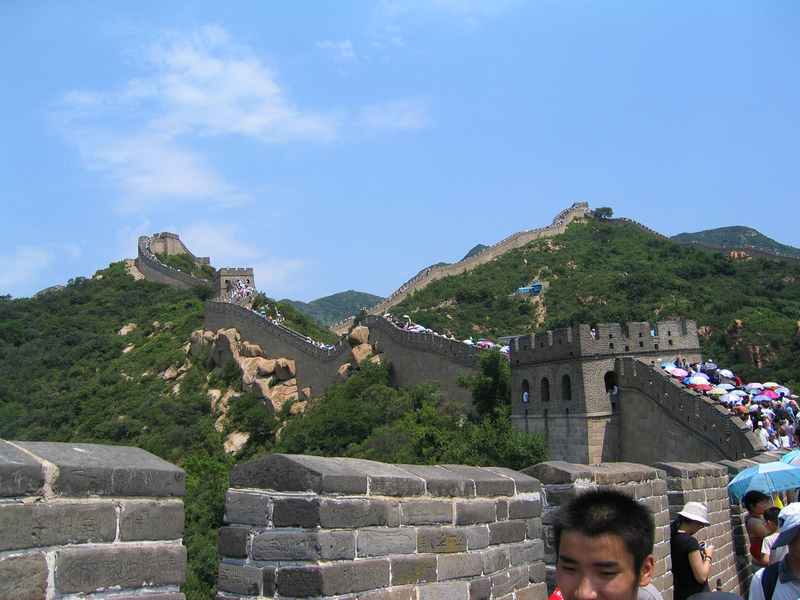 After the downfall of the Han dynasty (220 A.D.), the Great Wall entered its medieval phase. Construction and maintenance work were halted, only occasionally being recommenced. 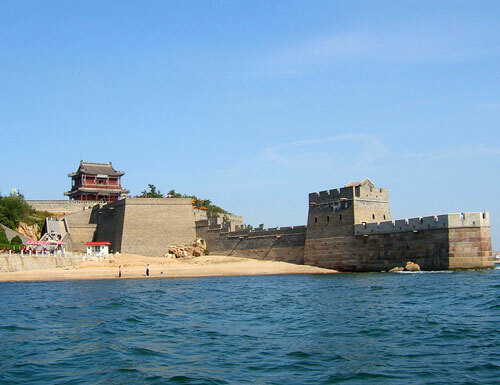 Under the Northern Wei, for example, a 600 mile (1,000-kilometer) section of wall was built in 423; this was added to in the 6th century, but work was suspended during the Tang period (618-907). China at that time enjoyed such great military power that the need for a defense policy was no longer felt. First Door Under Heaven, The Great Wall at Shanhaiguan the far Eastern End where it meets the sea at Bohai Bay , originally uploaded by [Satbir]. It was the Ming emperors (1368-1644) who, after the long period of conflict which ended with the expulsion of the Mongols, revived the tradition begun by Qin Shi Huang. During the Ming dynasty, 3500 miles (5,650 kilometers) of crenelated wall were built. The stones used were incredibly well matched, and the wall was fortified by 25,000 towers and protected by 15,000 outposts. To defend the northern frontier, the Wall was divided into nine Zhen, which were military districts rather than simple garrisons. At strategic points , fortresses were built to defend the towns (e.g. Jinshanling for Peking), passes or fords. The passageways running along the top of the wall made it possible to move troops rapidly and, in peace time, for imperial couriers to travel. Two symbolic monuments still proudly stand at either end of the wall. These are the "First Door under Heaven" at Shanhaiguan, located at the wall's eastern end, and the "Last Door under Heaven" at Jiayuguan, which, as part of the fortress entirely restored after 1949, marks its northwestern end. 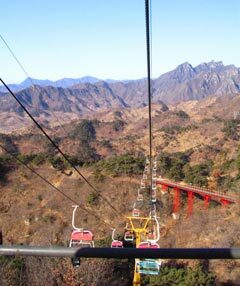 Great Wall Chairlift at Mutainyu near Beijing, originally uploaded by vipeldo. 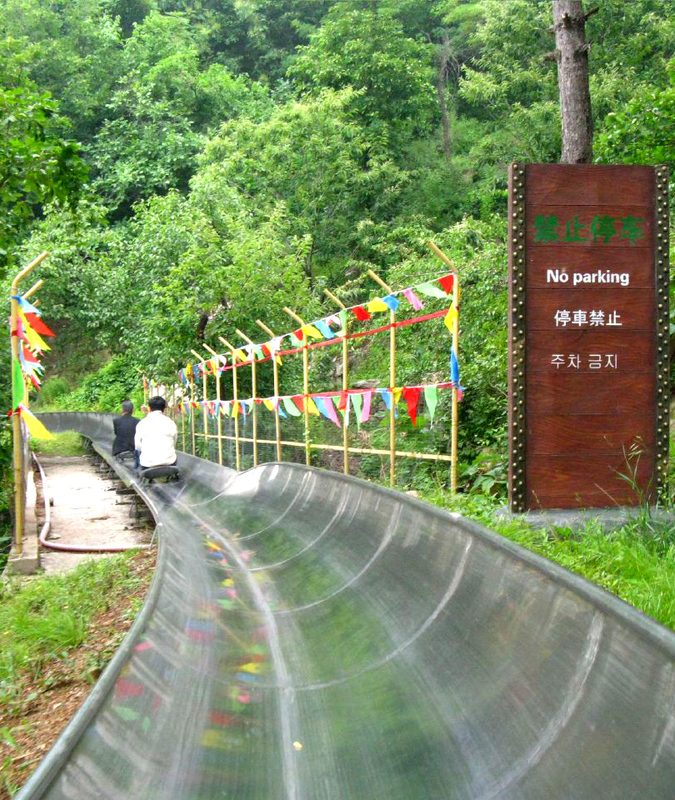 Great Wall Slide at Mutianyu near Beijing, originally uploaded by lanz. The Great Wall at Mutainyu is located in the Huairou District of Beijing. According to historical literature, this setion of the Great Wall was built under the supervision of General Xu Da of Emperor Zhu Yuanzhang in the early Ming Dynasty. 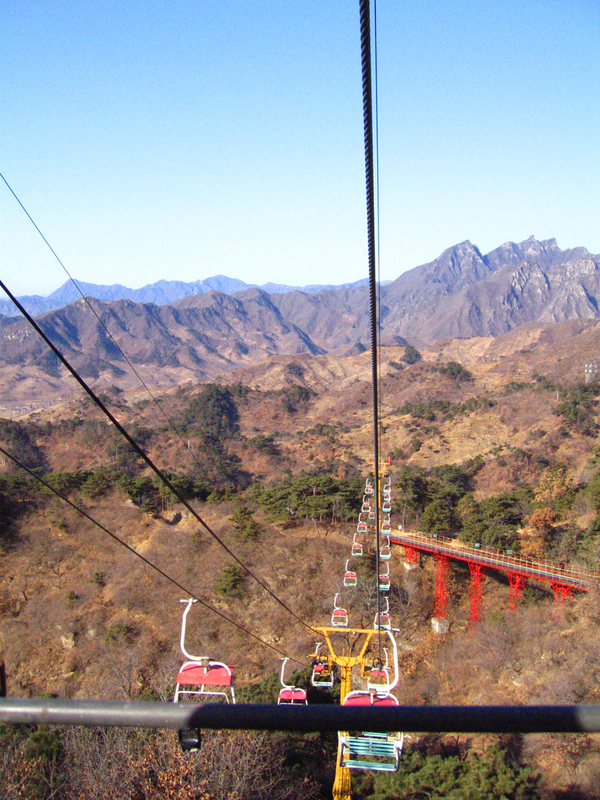 Mutianyu is a favorite tourist spot given its close proximity to Beijing. 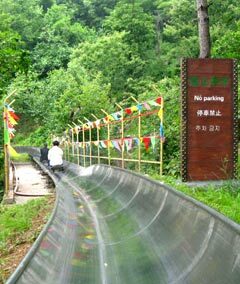 You can take a chairlift up to the Great Wall then when you are finished sightseeing you can take the slide back down. The Great Wall at Badaling near Beijing Originally uploaded by kenner116. Great Wall at Badaling Originally uploaded by Jack Parkinson Pics. 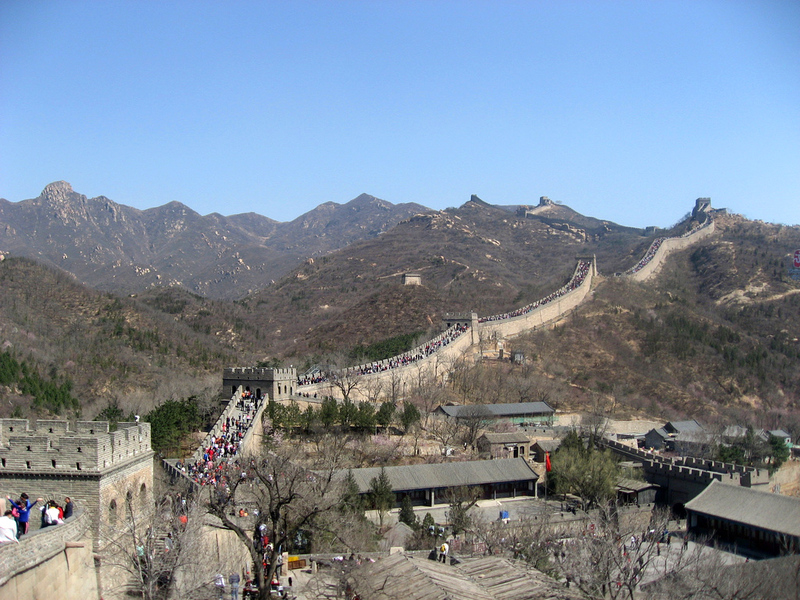 The Great Wall at Badaling can be very crowded, as seen in the above pictures, given it's proximity to Beijing. 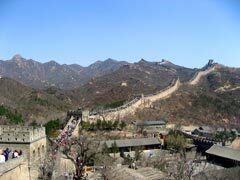 At Badaling the Great Wall is more than 23 feet ( 7 meters ) high and 16 feet ( 5 meters ) wide. Badaling was the advanced point of Juyongguan Pass in historical times with many fortresses and beacon towers built at strategic points. The Great Wall of China was included as a World Heritage Site on the basis of Cultural Criteria I, II, III, IV and VI in 1987. Criterion I. The Great Wall of the Ming is, not only because of the ambitious character of the undertaking but also the perfection of its construction, an absolute masterpiece. The only work built by human hands on this planet that can be seen from the moon, the Wall constitutes, on the vast scale of a continent, a perfect example of architecture integrated into the landscape. Criterion II. 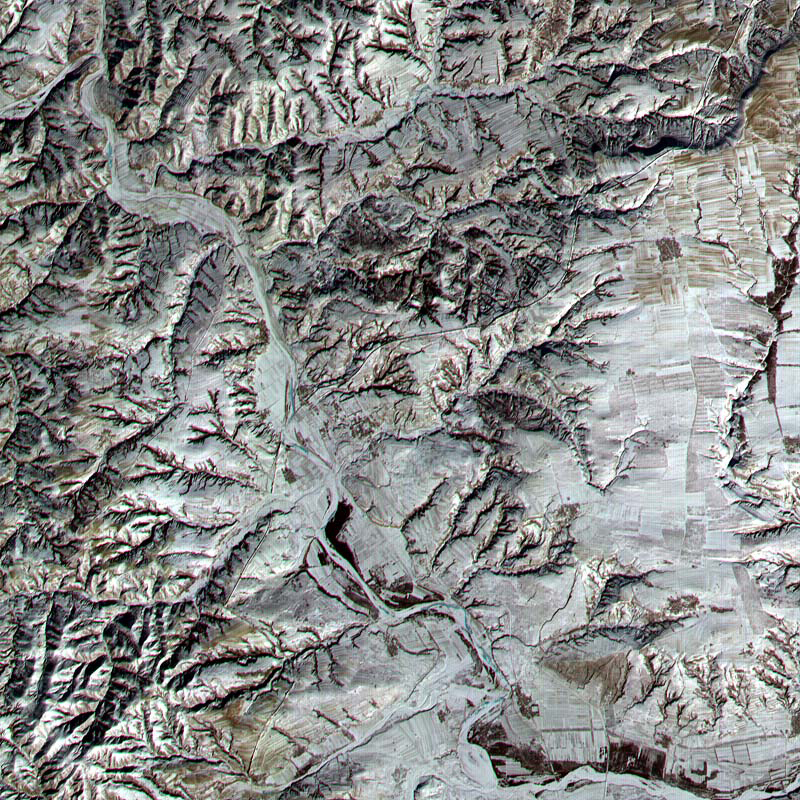 During the Chunqiu period, the Chinese imposed their models of construction and organization of space in building the defense works along the northern frontier. The spread of Sinicism was accentuated by the population transfers necessitated by the Great Wall. Criterion III. 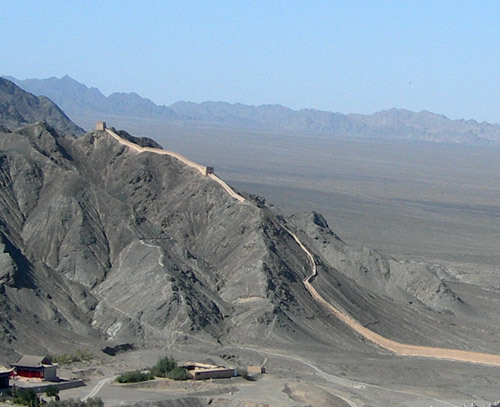 That the great walls bear exceptional testimony to the civilizations of ancient China is illustrated as much by the tamped-earth sections of fortifications dating from the Western Han that are conserved in the Gansu province as by the admirable and universally acclaimed masonry of the Ming period. Criterion IV. 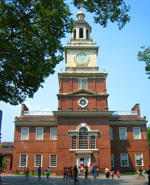 This complex and diachronic cultural property is an outstanding and unique example of a military architectural ensemble which served a single strategic purpose for 2000 years, but whose construction history illustrates successive advances in defense techniques and adaptation to changing political contexts. Criterion VI. 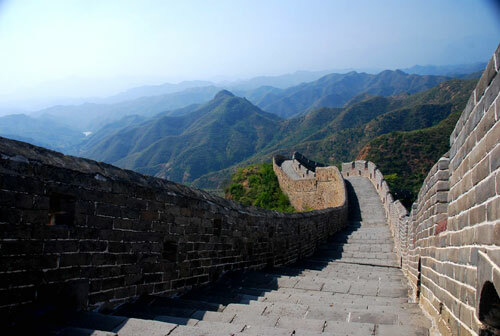 The Great Wall has an incomparable symbolic significance in the history of China. Its purpose was to protect China from outside aggression, but also to preserve its culture from the customs of foreign barbarians. Because its construction implied suffering, it is one of the essential references in Chinese literature, being found in works like the "Soldier's Ballad" of Tch'en Lin (c. 200 A.D.) or the poems of Tu Fu (712-770) and the popular novels of the Ming period. The Badaling section of the Great Wall of China is located about 36 miles ( 57 kilometers ) northwest of Beijing, China.